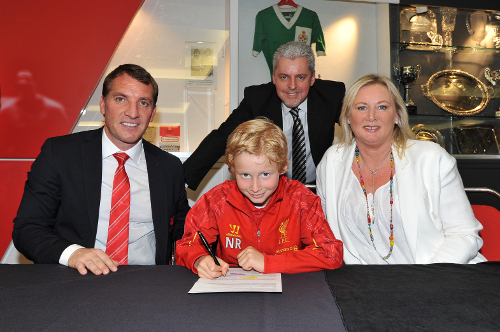 Brendan Rodgers was guest of honour as Liverpool made 28 new signings in one swoop at Anfield on Wednesday as part of the club's U9s intake day. Each year, the Reds Academy scours the north west in search of the next Steven Gerrard or Jamie Carragher and the latest batch of talented eight-year-olds were unveiled by the club as they committed their futures to the Reds. 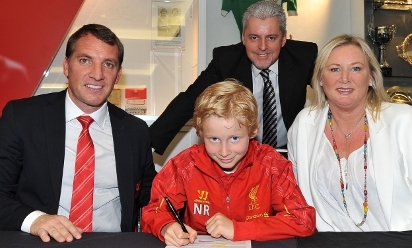 Rodgers received a fantastic ovation from the families present at Anfield and the manager was quick to point out just how vital the Academy is to the football club. He told Liverpoolfc.com: "The tradition of this great club has always been about young players and you can see in our first-team squad that we have a lot of young players. Some of them have come through the Academy system and are home-grown players. "These are great days. For the parents and the children it's their first steps at a huge club like Liverpool and it's hopefully a day they will enjoy and they will never forget. "The parents can be very proud. I know what it's like because my son played all the way through the age groups, so I know all the dedication and hard work that goes into bringing your son along to training, and at this age, it is vital because that's where the support really helps the children. "It's a great reward for them and hopefully they can enjoy the experience because that's what Liverpool is all about - bringing them into this Liverpool family and looking after them. "For the children, coming into this club, they are not just joining any club - they are coming to a club that is now a Champions League team. They are joining one of the biggest football clubs in the world. "There's obviously a long road ahead for them in terms of reaching the first team, but what they can take away is that the hope is there for them because our focus is very much on the young talent and players from within our club at our Academy. Hopefully they can find their way through. "They will be looked after at this club and if they develop well and they get a little bit of luck through their young lives and coming through then one day, hopefully, they can get to Melwood and play for the first team, ultimately." Ian Barrigan, head of local recruitment at the Academy, added: "It was a brilliant day for the kids and a lot of the boys have been here already for three or four years. It was a big reward for them and their proud parents. "It was brilliant for us to have our manager Brendan here because every player who signs for the club should sign for the manager, no matter what the age. 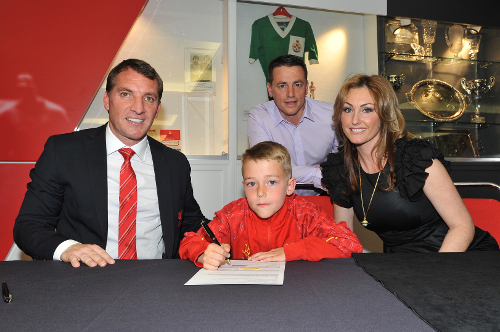 "It just shows you Brendan's support for the Academy and it is absolutely fantastic."